John A. Seaton, his father and his siblings were high achievers. Due to the required length of the newspaper article, “John A. Seaton – ‘A Giant of a Man’”, some unknown facts about John A. Seaton was not in the article. In 1867, John A. Seaton opened up a bank account in 1867 at the U.S. Freedman’s Bank. On his account, he stated he lived in Alexandria, VA. He listed his wife, Virginia, his son, John A., and his siblings George L. Seaton, Lucinda, Laura, Martha and Mary Ann. He made a $200 deposit in his account. John A. Seaton was a republican Chairperson from the seventh congressional district of Virginia. John A. Seaton’s third wife, Elizabeth Ann Grant-Seaton, was born in 1849. She and John married in Camden, New Jersey on April 4, 1890. They had been living together in New York. Elizabeth died on May 23, 1929 at the age of 80. She died at the home that John built in Bealeton, Fauquier, Virginia. 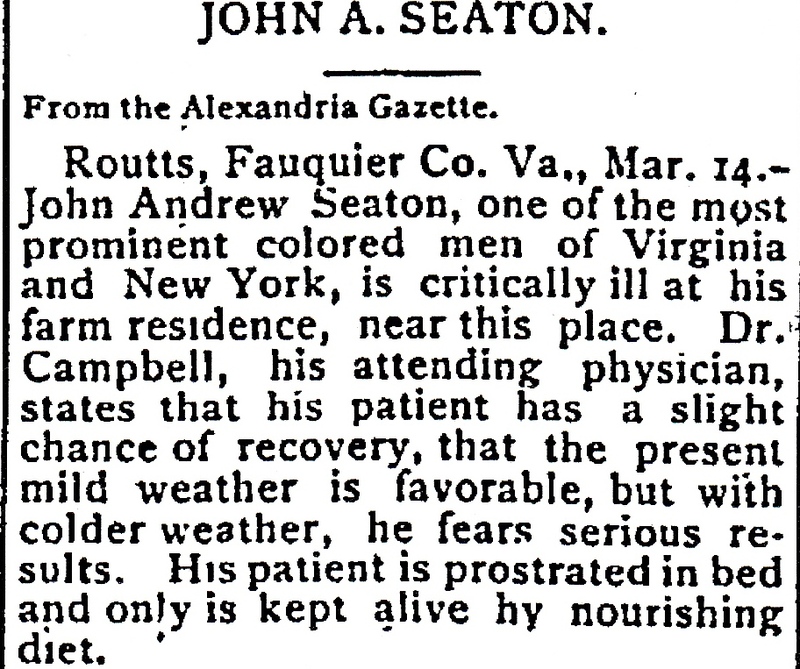 Mr. Seaton last job before his death was with the Equitable Life Insurance Company in New York City. He was one of the bodyguards to Equitable Life Insurance’s vaults. You can read the entire article on page 12 at http://connectionarchives.com/PDF/2018/092618/Alexandria.pdf. This entry was posted in Black People of Alexandria and tagged Black Alderman, Seaton. Bookmark the permalink.